Dean Buchser has been creating mosaics for over twenty years, He thrives on the vibrant colors and reflections in his mosaic mirrors. The convex mirrors warp what we see into what it just might be. What exactly is behind the looking glass? 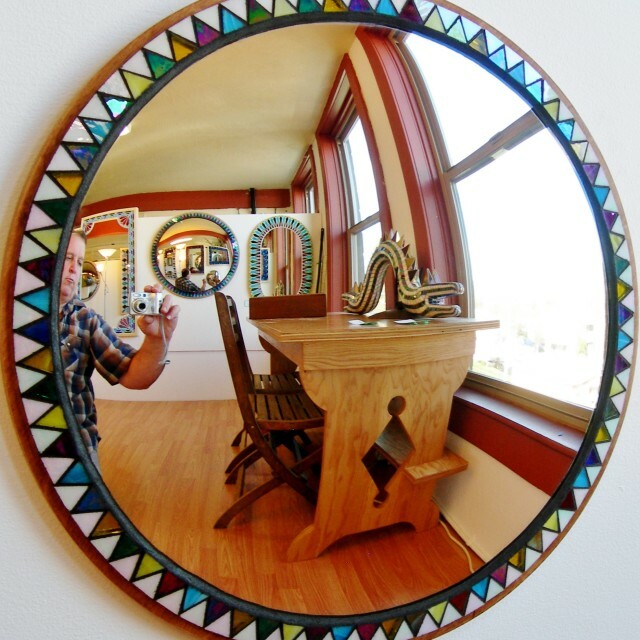 Creating mosaics for over twenty years, I thrive on the vibrant colors and reflections in my mosaic mirrors. The convex mirrors warp what we see into what it just might be. What exactly is behind the looking glass? With a zest for Central American culture and my early years in the desert southwest, I sculpt what I have seen in my dreams. There are places in time that change us and sculpt us into who we are, who we have been and who we will become. These little steps or giant leaps we take are so much who we are as people and as artists. Visit Dean upstairs in Studio #8. April is Sexual Assault Awareness Month! Sexual Assault Survivor’s Healing (SASH) Group Art Show will be in the main classroom.